The Orlando Pride hosted Portland Thorns FC in the opening match of the 2019 NWSL regular season for both teams. 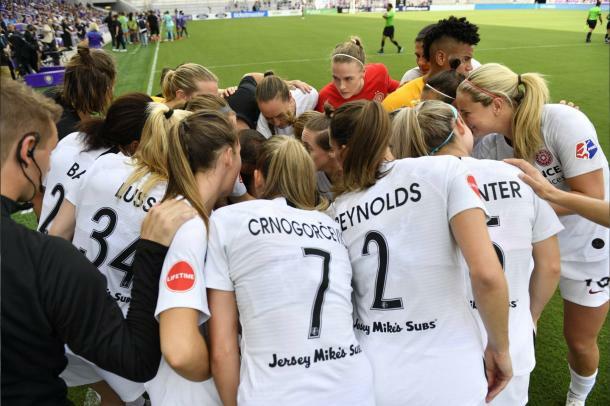 Portland Thorns FC earned three points and a shared place at the top of the National Women's Soccer League table by beating the Orlando Pride in Orlando on Sunday afternoon. Portland controlled the game from beginning to end and got goals from Australian forward Caitlin Foord and United States Women's National Team midfielder Tobin Heath while holding Orlando to just two shots on goal. There were occasional chances for Orlando, including a pair of breakaway attacks in the first half and a long distance shot by Alex Morgan that hit the crossbar, but the rest of the game was dominated by Portland. PTFC is feeling good as they picked up right where they left off in 2018. Portland won eight of their last ten matches last season. Orlando is in the opposite situation, where new head coach Marc Skinner could not shake the four-game losing streak that extended to five on Sunday. Portland almost took the lead in the fifth minute. Canadian forward Christine Sinclair headed the ball on frame and beat Orlando goalkeeper Ashlynn Harris, but midfielder Bridget Callahan was able to head the ball away from goal from the end line. Despite continuing to control the run of play, it took Portland until the 45th minute to finally score their first goal of the match. Heath found the ball at her feet inside the Pride penalty area. Faced up against two defenders she rolled the ball back to the feet of Foord who easily finished against Harris who was not ready in goal. The Thorns started the second half in similar form. Foord found herself on the right side of goal and played the ball on the ground across the front of the six yard box. The ball was behind Heath, but she managed to catch the ball as it went past and redirect it on goal. It was an agonizingly slow roll past the outstretched hands of Harris while she was on the ground, having not expected the shot. Orlando didn't give up. In the 58th minute, Alex Morgan took a long range shot that beat Portland goalkeeper Adriana Franch, but it hit the crossbar. In stoppage time, substitute Kristen Edmonds had the ball right at her feet about 10 yards away from goal, but she skied the shot and ensured Portland's clean sheet. Orlando will need to recover quickly. They play against the North Carolina Courage on Wednesday in Cary, NC. The Courage beat Orlando in pre-season 4-0. The Thorns start their season with six straight road matches due to expansion construction at Providence Park, their home field. They will travel to Chicago to take on the Chicago Red Stars next Saturday.